Both new apps came were released into the App store late yesterday, they’ll take a little time to work through into all the App store catalogues. Work continues on the next App, an iPad version of Print-O-Calc which is providing lots of opportunities for creative fun and frolics. I passed an interface mock-up through a filter I was playing with and came up with what looks like an LSD induced nightmare, but which I have grown to love. Other examples on the website here. I may have got a bit carried away with this so I’ll stop now, probably. We were at the Millennium Stadium today seeing our brave and noble lads take on the reigning Rugby world champions and coming so close to a heroic and memorable win, but with a couple of 50:50 decisions going one way rather than another it wasn’t to be. No shame in that, it’s just the way life is sometimes. The Age of Steampunk Apps? As I remarked to the Cat the other day, once someone has an iPhone they have with them most of what people want or need to carry about. The functionality and capabilities are astonishing, to the point where developers can take a favoured or useful object and add functionality that in the real world would be impossibly complicated, expensive, unreliable or all three. 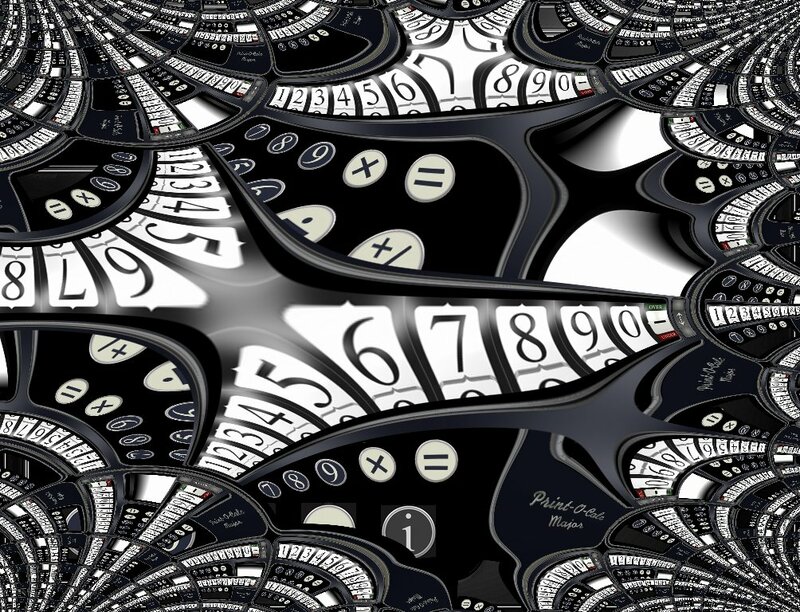 As a long time Steampunk enthusiast, I have been keen to bring some of the delicious (Often pointlessly extravagant) imagery and feel into my apps. To that end I have taken a retro step with the next App to be released with a late 50’s / early ’60’s casing (The last years of pressed tin casings) and Victorian / Edwardian typewriter style keys. This is hardly steampunk, just a flirtation with its tropes, but it is a step in that direction, largely inspired by the “New Victorians” enclave in Neal Stephenson’s Diamond Age. That book’s “Young Lady’s Illustrated Primer” is surely not too far away now in some form, which is an enticing prospect for future education. 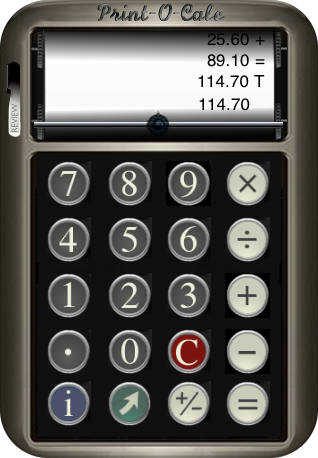 The App (Print-O-Calc) has a real purpose, to provide the functionality of a printing pocket calculator, something I always wanted. Of course it can’t print (Until the next release of OS4 which will allow direct printing to some HP printers) but it can copy the tally roll into the cut / paste buffer for pasting into notes, e-mails, messages etc. To add to the fun, it has animated paper and print head motion and sounds, although the sounds can be disabled once the novelty has worn off. I’m still testing but will submit it for release sometime this week. Should you wish, you can read more here.